My first sight of the snowy Pyrenees from Mallorca, crossing the Mediterranean sea and entire Catalonia for 300 km, as seen from Puig Roig summit (1002 m.) at Tramuntana hills. At sunset, during a bivouac at Tramuntana hills, unexpectedly I happened to spot a rather huge part of Spain’s mainland on the horizon—almost 20º—, including the snowy Pyrenees mountain range. This is the most amazing distant view I’ve ever experienced. This picture portrays the farther point of the scene: Tossal de la Muga, located in the heart of the Pyrenees mountains on the border between Andorra and Spain. Many more pictures were taken from this same point during the whole evening. 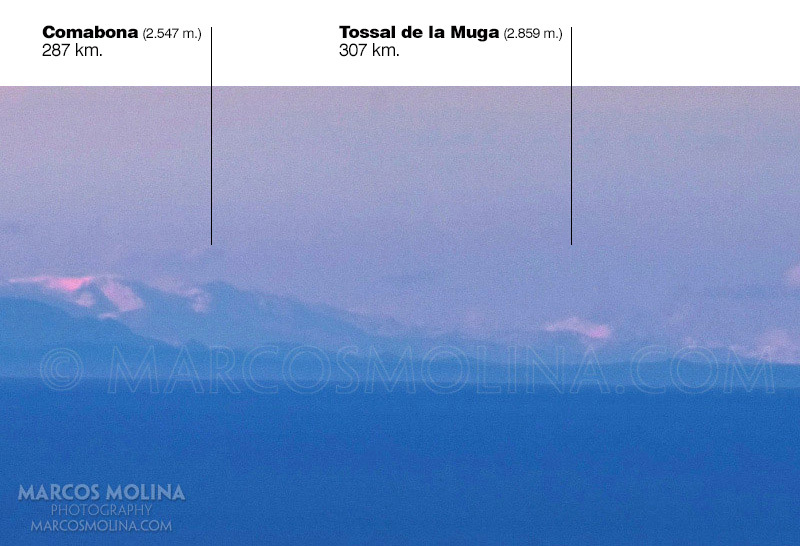 Puig Roig is “only” 1002 m. high, vs. Puig Major, highest elevation in Mallorca (1436 m.), a mere 8 km away. The access to Puig Roig top is easy (4 h. walking from Lluc Sanctuary), but permission in advance must be asked as it’s a private Estate. Weather at the top was windy NW, dry and partly overcast by high clouds which did not affect the excellent —and very rare— visibilty. The raw image file has been processed in order to increase contrast and color saturation. 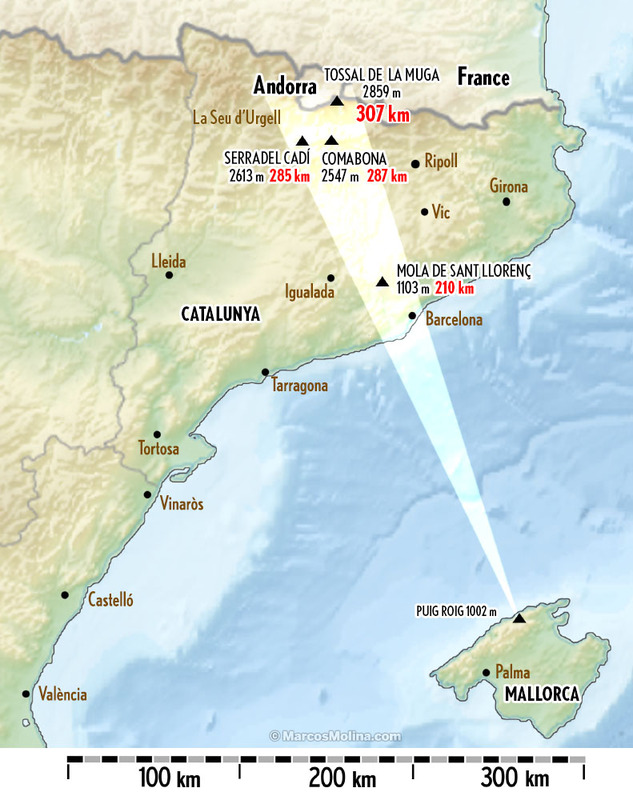 < Previous Penyagolosa – Puig Major | 272 km. Next > Penyagolosa – Pyrenees | 289 km.